Have you ever made a guitar stand? 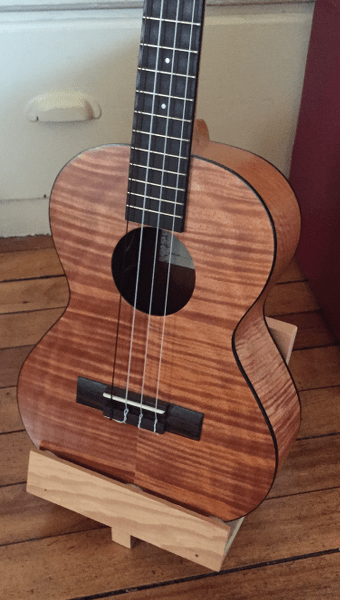 Or have you thought about making something to hold your ukulele? Why would anyone do that? There are a number of reasons to make your own instrument holder. You might be a gifted crafts person and your creativity and passions drive you to combine your love for guitar and making things to build yourself a unique guitar, violin or ukulele stand (or whatever other instrument you play). Alternatively you may have an unusual problem you need to solve such as a rare and oddly shaped instrument that doesn’t fit standard instrument stands. But often the reason is you are financially challenged or in a hurry. The following is a Pinterest Board of Guitar Stands that have been made by people with talent. Follow Dan's board Guitar Stands on Pinterest. Sadly I’ve attempted to make instrument stands more than once. I am no craftsman and I doubt anyone will applaud my creativity with what I’ve done. I’ve built functional, unfinished, cheap and quick pieces that serve my needs. Never-the-less I am going risk ridicule and describe and show some ideas you may be interested in if you need a stand. The easiest place to put an instrument, particularly for display, is hang it on a wall. 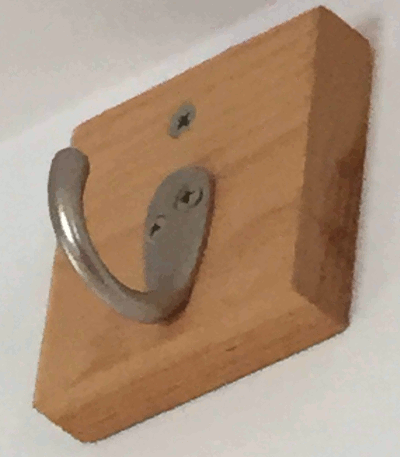 A simple cup hook may be sufficient for some instruments but be careful that the hook can’t pull out of the wall. One step up is a better looking and stronger hook mounted securely to the wall. This works well for headless guitars if they have a leather hanger near the nut as shown on the right. Hooks are also good for smaller instruments like ukuleles. The ukulele is hanging from a leather strap that goes over the tuners. These leather straps actually came from men’s suspenders designed for trousers with suspender buttons. You might be able to find these individually or maybe you have some unused suspenders. The image on the right links to some inexpensive suspenders on Amazon that includes three of these straps (Currently under $6). 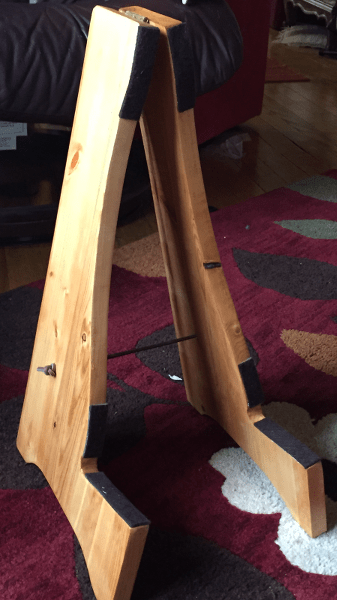 Another of my quick and simple designs was for a floor (or table) ukulele stand. It was intended to be a prototype but it works even if it is unfinished and not particularly appealing to look at. Felt protects to front and back of the ukulele and rubber feet keep the ukulele’s bottom from being scratched while also helping to hold the uke in place. The ukulele stand, like many of my projects, was constructed from scrap wood pieces I have in my basement. I’m no craftsman but I’ve got tools and like to tinker. It wouldn’t be difficult for someone with the right temperament and more skill than I have to add some artistic flourishes to these, finish them nicely and perhaps start with much nicer woods than pine scraps. The inspiration for this post was my recent project. I wanted a nicer stand for my new classical guitar. I convinced myself I could build a decent wood guitar stand. The design I chose can be found in many places on the internet. It is a popular project for woodworkers and easy to customize it to your skills and specifications. It is usable but I’ve got an inexpensive baritone ukulele on it now. 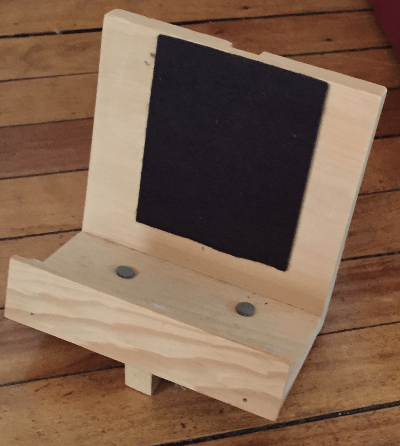 I ended up purchasing a commercial stand for the classical guitar. Ultimately, I prefer commercially made guitar stands. I hope to review my favorites soon. Making your own stand is great if you’ve got the skills or vision, otherwise it’s a stopgap measure.